For example, the CERES website has data quality summaries, such as this one for top of atmosphere data. The paper states it "represents the minimum information needed by scientists for appropriate and successful use of the data product". Now, there are several very curious aspects to this figure. The first and most surprising issue is that the hemispheric values for shortwave, and also the hemispheric values for longwave, are nearly identical from hemisphere to hemisphere. Why should that be so? There is much more ocean in the southern hemisphere, for example. There is solid land at the South Pole rather than ocean. In addition, the underlying surface albedos of the two hemispheres are quite different, by about 4 watts per square metre. Also, the southern hemisphere gets more sunlight than the northern hemisphere, because the earth’s orbit is elliptical. So given all these differences … why should the longwave and shortwave in the two hemispheres be the same? Given the myriad differences between the northern and southern hemispheres, my explanation of this amazing stability is that a) the temperature of the planet is regulated by a variety of threshold-based processes, and b) the set-point of that regulation is controlled by globally consistent values for the physics of wind, water, and cloud formation. Now, there certainly may be some other explanation for this amazing stability and symmetry of the climate despite the large differences in the geometry and composition of the two hemispheres. That’s my explanation. If you have a better one … bring it on. One can only guess what Willis means in his first paragraph above. He's probably talking about his thunderstorm thermostat hypothesis, but it's pretty well gobbledegook. Especially his bit about "the set-point of that regulation is controlled by globally consistent values for the physics of wind, water, and cloud formation". Never mind his silly "set point" notion - which is contradicted by paleo records (glacials and interglacials). What about his "Globally consistent values for the physics"? Does he mean that the behaviour of wind, water and cloud formation is consistent with known physics? That's a bit trite, surely. Or is he trying to say something else. Who knows. Anyway, I'm not so daft as to try to analyse or even interpret the TOA data from CERES. One look at the data quality summary and I know I'm quite out of my depth. It would take me longer than the time I have to start to come to grips with it all. 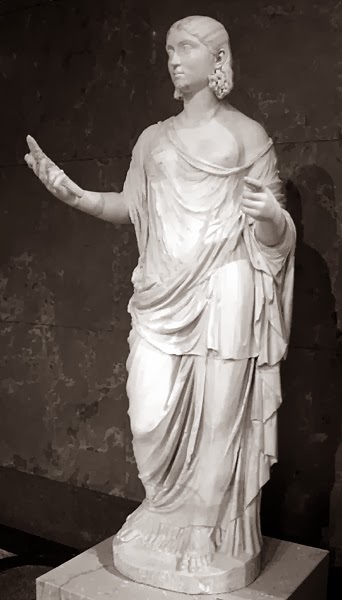 However, I did take a peek at the charts on the CERES website. 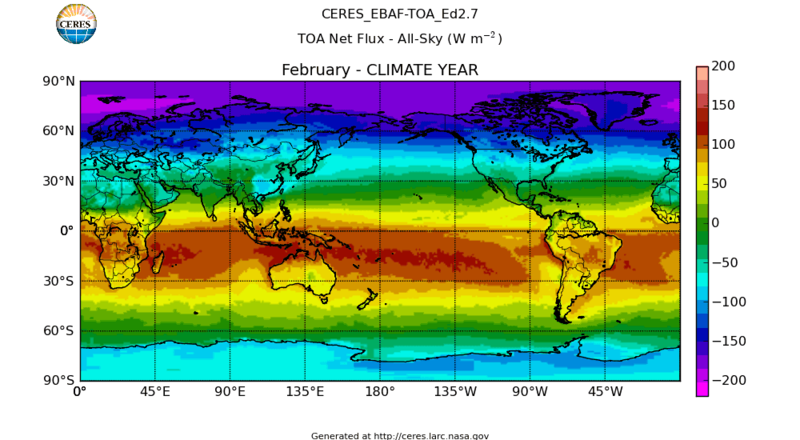 Below, for example, is an animation of the change in TOA net flux (all sky) over a climate year by latitude. I've got to say there look to be differences between the net flux at different latitudes over the year. However that's not broken down into longwave and shortwave fluxes. Even so, if there is a difference then at least one of shortwave or longwave (or incoming solar) must also be different. You can see the shortwave and longwave variations by latitude here. Click on one of the charts to view month by month as a slide show. There's another NASA web page that has an animation of the net radiation over the globe from July 2006 to October 2013. It's mesmerising. As stated on the website, "averaged over the year, there is a net energy surplus at the equator and a net energy deficit at the poles. This equator-versus-pole energy imbalance is the fundamental driver of atmospheric and oceanic circulation." Here is a chart showing the annual solar insolation over the year by latitude. The page from which the above diagram came discusses the radiation budget in terms of incoming, reflected and net radiation. It also uses one of Willis' favourite analogies (which I think he thinks he invented), the heat engine. It's part of a series of articles at NASA's Earth Observatory website, on the topic of Climate and Earth’s Energy Budget. It would pay for anyone taken in by Wondering Willis to read it. Willis might learn something himself, if he chose to. Now back to Willis' question. He asked why longwave and shortwave are the same for each hemisphere. While the concentration of landmasses and atmospheric aerosols on the Northern Hemisphere suggests that the Northern Hemisphere is brighter than the Southern Hemisphere, satellite measurements of top-of-atmosphere irradiances found that both hemispheres reflect nearly the same amount of shortwave irradiance. 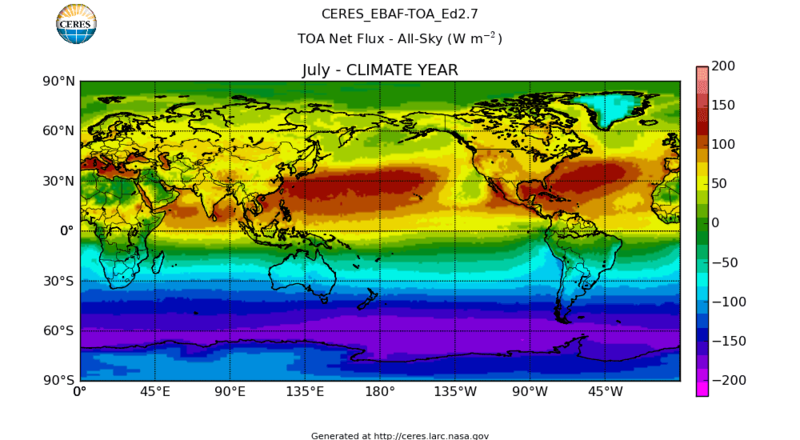 Here, the authors document that the most precise and accurate observation, the energy balanced and filled dataset of the Clouds and the Earth’s Radiant Energy System covering the period 2000–10, measures an absolute hemispheric difference in reflected shortwave irradiance of 0.1 W m−2. 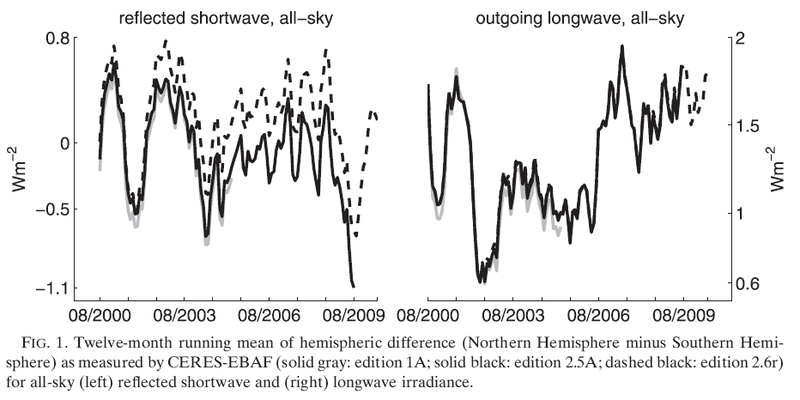 In contrast, the longwave irradiance of the two hemispheres differs by more than 1 W m−2, indicating that the observed climate system exhibits hemispheric symmetry in reflected shortwave irradiance but not in longwave irradiance. The authors devise a variety of methods to estimate the spatial degrees of freedom of the time-mean reflected shortwave irradiance. These are used to show that the hemispheric symmetry in reflected shortwave irradiance is a nontrivial property of the Earth system in the sense that most partitionings of Earth into two random halves do not exhibit hemispheric symmetry in reflected shortwave irradiance. Climate models generally do not reproduce the observed hemispheric symmetry, which the authors interpret as further evidence that the symmetry is nontrivial. While the authors cannot rule out that the observed hemispheric symmetry in reflected shortwave irradiance is accidental, their results motivate a search for mechanisms that minimize hemispheric differences in reflected shortwave irradiance and planetary albedo. Voigt, Aiko, Bjorn Stevens, Jürgen Bader, Thorsten Mauritsen, 2013: The Observed Hemispheric Symmetry in Reflected Shortwave Irradiance. J. Climate, 26, 468–477. A remarkable study. The explanation s that there is a very stable set of control systems in the atmosphere which use CO2 as the working fluid thus reducing CO2-AGW to near zero. The other issue is that the ‘forcing’, black body real surface energy flux and ‘back radiation’ ideas in Climate Alchemy are bad physics and must to be junked before the theory can advance. Willis, could it be something to do with atmospheric pressure being the regulator? I have to say I would be amazed if there was a balance of zero. Plant life consumes energy, and the biosphere is growing. Every movement of any tree or structure by wind causes changes within that tree or structure that are locked there for its life. The whole of Earth is constantly being eroded by energy changes, rocks crack, metals corrode. How much energy is dissipated in a large wave? Where does it go to? No, here MUST be more energy coming in than going out for the Earth to function. Actually slightly more energy must be going out than coming in, since geothermal heat is continuously being created by radioactivity. There may also be some residual heat from the early stage of planet formation, plus a little bit being liberated by tidal braking of the Earth’s rotation. In all about 0.1 wm-2. It’s like I’m stuck inside David Icke’s head. Shouldn’t be too hard. All anybody has to do is solve the equations of motion of two nonlinear fluid systems coupled on a rotating sphere and subject to differential heating, turbulent mixing, random phase changes, low frequency inputs on unknown time scales and radiative transfer processes across the spectrum. I keep hearing that this is “simple physics”. Why should the longwave and shortwave in the two hemispheres be the same? I’ll keep tuned to your inquire. ...EITHER PROVIDE PROOF OF YOUR FALSE CLAIMS, OR STAND CONVICTED OF BEING A HILARIOUSLY CHILDISH LYING SACK OF PORCINE EXCREMENT! Is that clear enough for you, you libelous scumbag? That's not very nice, Willis, is it. My money's on Willis to be the first to score a double century, though Ball obviously is in good nick. And elsewhere, if we slightly tinkered with the definitions, Delingpole is quite capable of notching up a triple century in a single knock. Totting up Monckton's score might prove problematic. Great - it fits the pseudo-scientists at WUWT to a T.
Surely Willis has hit 300 by now. He's way ahead of Tim Ball who doesn't propose any "theories" AFAIK other than conspiracy theories, and he's borrowed them from other paranoid conspiracy theorists. Willis and Bob (Tisdale) are probably neck and neck. Willis might be a few runs ahead.